At Spartan Logistics, we know that your own company is the most important one to you. You want the best 3PL systems and solutions for your own business, and you want it scaled and customized to meet your needs based on market conditions. This is why there is no such thing as a “generic industry solution” from Spartan Logistics. Our information technology solutions work with the processes that drive your business. Since Spartan has been working with numerous businesses over the last few decades, we have the experience necessary to understand the demands of your business. Our Warehouse Management System (WMS) is a custom-designed third party logistics software, requiring continuous updates to meet the technology needs of your business. Our specialized technology partners, Camelot Consulting, work with us on a near-daily basis to make sure that our WMS has the most current features to be the perfect fit for any of our customers. Learn more about our technology and what our business can do for you by contacting our marketing representative. Our ability and willingness to work with our customers’ information technology platforms is what puts Spartan ahead of our competition. We have made and met the commitment to being a partner by integrating the technology systems of our customers into our own business processes. We believe this is a clear demonstration of Spartans’ promise to do whatever it takes to make a partnership work. 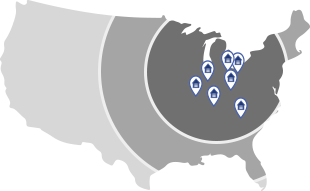 Our current EDI (Electronic Data Interchange) trading partners include Wal-Mart, K-Mart, Target, Sam’s Club, Cracker Barrel, Michael’s, Rite-Aid and Meijer.